You are buying the FlexiFit 406 Foam & Seal Kit Fisher & Paykel 400HC509, manufactured by Fisher & Paykel. Fisher & Paykel is a leading manufacturer of CPAP machines and CPAP accessories. At ADW Diabetes, we offer the complete product line by Fisher & Paykel with great savings and excellent service. You are buying the FlexiFit 406 Foam and Seal Kit Fisher and Paykel 400HC509, manufactured by Fisher and Paykel. Fisher and Paykel is a leading manufacturer of CPAP machines and CPAP accessories. At ADW Diabetes, we offer the complete product line by Fisher and Paykel with great savings and excellent service. 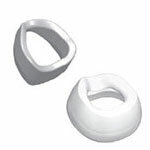 The FlexiFit 406 Foam and Seal Kit Fisher and Paykel 400HC509 is designed for the Fisher and Paykel Flexifit 406 Petite Nasal CPAP Mask (HC406). This replacement seal kit includes the foam and silicone seal components.